(Nanowerk News) Physicists at JILA have created the first "frequency comb" in the extreme ultraviolet band of the spectrum, high-energy light less than 100 nanometers (nm) in wavelength. Laser-generated frequency combs are the most accurate method available for precisely measuring frequencies, or colors, of light. In reaching the new band of the spectrum, the JILA experiments demonstrated for the first time a very fine mini-comb-like structure within each subunit, or harmonic, of the larger comb, drastically sharpening the measurement tool. The new comb, described in the Feb. 2 issue of the journal Nature ("A frequency comb in the extreme ultraviolet"), confirms and expands on the JILA group's 2005 claim of the ability to generate extreme ultraviolet (EUV) frequencies for making precise measurements in that part of the electromagnetic spectrum. The new tool can aid in the development of "nuclear clocks" based on ticks in the nuclei of atoms, and measurements of previously unexplored behavior in atoms and molecules. JILA is a joint venture of the National Institute of Standards and Technology (NIST) and the University of Colorado Boulder. "Nobody doubted that the EUV frequency comb was there, it's just that nobody had seen it with real experimental proof," says NIST/JILA Fellow Jun Ye, the group leader. "The new work provides the first experimental proof, and also really shows that one can now do science with it." Frequency combs are created with ultrafast pulsed lasers and produce a span of very fine, evenly spaced "teeth," each a specific frequency, which can be used like a ruler to measure light. Frequency combs are best known for measuring visible and near-infrared light at wavelengths of about 400 to 1500 nm (frequencies of about 750 to 200 terahertz, or trillions of cycles per second), enabling development of next-generation atomic clocks (See the NIST background paper "Optical Frequency Combs"). In the past few years researchers at JILA, NIST and many other laboratories have pushed comb boundaries toward other regions of the electromagnetic spectrum. To create the world's first extreme ultraviolet (EUV) frequency comb, JILA scientists used a high-power laser to generate infrared light pulses that bounce back and forth and overlap in an optical cavity 154 million times per second(a frequency of 154 megahertz, or MHz). When xenon gas is injected into the cavity, the laser field drives an electron temporarily out of each atom of gas. When the electron snaps back into the atom, it generates a train of light pulses with a duration of several hundred attoseconds each (1 attosecond is 0.000 000 000 000 000 001 seconds). The process generates "harmonics"—strong signals at regular fractions of the original infrared wavelength. As a result of the high repetition frequency of the laser (154 MHz), for the first time ever, each harmonic has its own set of "teeth" marking individual frequencies, a mini frequency comb within the big comb. 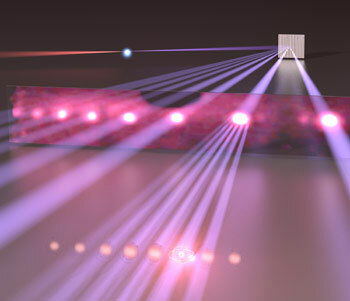 The EUV comb is the first system for high-accuracy laser spectroscopy—the use of light to probe matter and make measurements traceable to international standards—at wavelengths below 200 nm, a frequency of more than 1 petahertz (quadrillion cycles per second). The EUV comb is the culmination of several technical advances, including improved high-power ytterbium fiber lasers, an optical cavity formed by five mirrors in which light pulses overlap perfectly and build on each other in a stable way, and better understanding of the plasma (a mix of electrons and electrically charged atoms, or ions) required to generate EUV light inside the cavity. Researchers finally achieved an ideal balance of high power and stability in the cavity. Applications for the new comb include the development of nuclear clocks, based on changes in energy levels of an atom's nucleus instead of the electronic structure as in today's atomic clocks. The nucleus is well isolated from external interference and thus might make an extremely stable clock. Other applications include studies of plasmas such as those in outer space; and searches for any changes in the fundamental "constants" of nature, values crucial to many scientific calculations. Ye hopes to continue extending combs toward shorter wavelengths to create an X-ray frequency comb. This research is a result of a five-year collaboration between JILA and IMRA America Inc., of Ann Arbor, Mich., which designed and built the high-power precision ytterbium fiber laser specifically for this project. The research was funded in part by the Defense Advanced Research Projects Agency, the Air Force Office of Scientific Research, NIST and the National Science Foundation.